We now have two single-family floorplans with bedroom suites on the main level. Hamilton, VA — If you’ve been following our blogs, you know we recently introduced The Pinehurst, our newest and largest (at 5087 sq. feet ) single family home model, and our first home with an owner’s suite included on the main level. It is available at either Waterford Creek in Hamilton, VA or Shaker Knolls, our just-opened Herndon single family home community. But, we didn’t want to overlook weekend guests, in-laws or anyone else. So now, one of our most popular home models (and a GALA award-winning design) The Lancaster, gives you the opportunity to add a private, corner 5th bedroom and full bath on the main level, along with an adjacent sitting room. Like the Pinehurst model, you’ll find the Lancaster available at both Waterford Creek and Shaker Knolls. 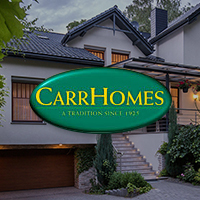 Email Tom West, TWest@CarrHomes.com, or call Tom, 703-926-7421, for more details.